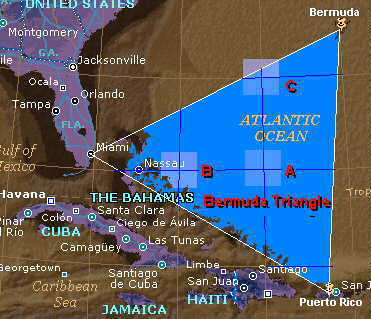 Bermuda Triangle or Devil's Triangle, situated at Atlantic Ocean with an area of 1.5-million-square-miles connecting the points of Bermuda, Puerto Rico and extreme South of Florida. It is also known as Limbo of the Lost. The Twilight Zone. Hoodoo Sea. The Devil's Triangle. The vast three-sided segment of the Atlantic Ocean bordered by Bermuda, Puerto Rico and Fort Lauderdale, Florida, did not receive its most famous nickname until 1964, but reports of bizarre happenings there, or nearby, have been recorded for centuries. In fact, many claim that Christopher Columbus bore witness to the Bermuda Triangle's weirdness.